"Find any dental diode laser that can meet or exceed our Beamers in Accuracy of Energy Delivery, Reliability, Customer Satisfaction, Low Overhead Cost and Training Offered and we will issue you a full refund". 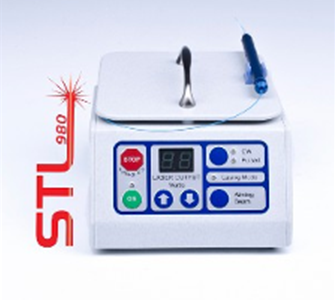 This premium laser operates with a 0 to 5.0 watts continuous wave. We are the only manufacturer of a 200 hz, 7 watt amplitude "self adjusting" pulse mode. We use Hospital-grade controls, single fiber focused modules. All Beamers are calibrated by a Ph.D. laser physicist, every Beamer, every time. Our laser modules are rated at 15+ years. We have the highest customer satisfaction of any dental laser. The Beamer STL 980 is $6995.00. We accept all major credit cards and offer financing options up to 60 months, with no early payoff penalty. Our Beamers come with a 180-day right to return guarantee, (call for details), a three-year warranty, and unlimited video conference training. In-office training is offered at a very reasonable rate. In-Office training is included when you order 2 or more Beamer STL 980 lasers., you pay trainers expenses only! Lead time for orders is a week, and all orders are shipped via USPS Priority mail.